The gift shop in the Polish parliament in Warsaw has removed from sale Jewish statuettes after criticism from a leading anti-racism organisation in October. 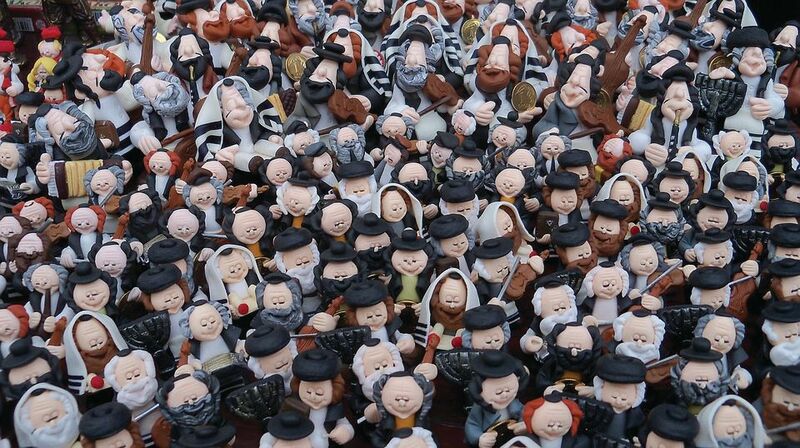 The trinkets, which are sold in tourist shops across Poland, are seen as good-luck charms and depict Jewish men in typical orthodox dress holding coins or sacks of money. Rafal Pankowski, one of the founders of the organisation Never Again that led the criticism, says the figurines depict “deeply rooted negative stereotypes”. Parliament “should guarantee respect for all types of minorities and that includes the Jewish minority,” he adds. Poland has seen a steady rise in nationalism since the right-wing PiS party came to power in 2015. “There is a climate in Poland today that could be seen as empowering the far-right and fostering xenophobia, islamophobia and anti-Semitism.” This phenomenon reached its peak in November when right-wing nationalists led a march of 60,000 people in Warsaw. Pankowski says the demonstration, which began in 2009 with around 500 participants, has “grown bigger and bigger every year”. The figurines are a small illustration of “how Polish identity is understood in terms of otherness and the stereotype of the other,” he says.